Rose Coschignano/Pipe Dream Photographer BU welcomed former Olympic marathon runner Joan Benoit Samuelson as the featured speaker at the 14th Annual Celebrating Women’s Athletics Luncheon. 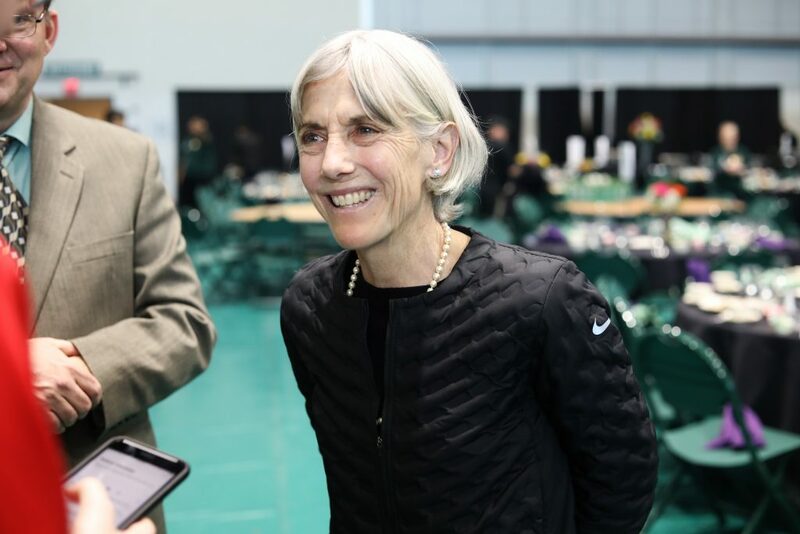 On Monday afternoon, the Binghamton Athletics Department welcomed former Olympic marathon champion Joan Benoit Samuelson as the featured speaker at the 14th Annual Celebrating Women’s Athletics Luncheon. Benoit Samuelson was the first ever women’s Olympic marathon champion, taking the gold medal at the 1984 Summer Olympics in Los Angeles. Additionally, she won the Boston Marathon in 1979 and 1983, setting a record time for women in 1983 that held for 28 years. The first Celebrating Women’s Athletics Luncheon was held in 2006, with 75 attendees. The event has developed into one of the athletic department’s largest fundraisers. This year’s 780 attendees represented the highest total in the luncheon’s 14-year history. During her speech, Benoit Samuelson emphasized to the athletes in attendance the importance of devotion. Another major theme was the significantly improved culture surrounding women’s athletics that exists today, as opposed to when she was young. Other speakers from the event’s illustrious history include former United States women’s soccer midfielder Shannon Boxx, Women’s Basketball Hall of Fame inductee Rebecca Lobo and former softball Olympian and current ESPN baseball analyst Jessica Mendoza. The luncheon was not the only event Benoit Samuelson took part in during her visit to Binghamton. At 7:30 a.m. Monday morning, she joined BU President Harvey Stenger for a run around campus, along with members of Binghamton’s track and field and cross country teams. Open to the public, attendees included BU alumni and staff members, among others. This year’s event raised over $50,000 to support the Binghamton Bearcats Athletic Association Women’s Scholarship Fund. Senior outside hitter Erin Shultz, a four-year starter on the Binghamton volleyball team, is one of 10 recipients of this year’s scholarship. Shultz was selected as this luncheon’s student speaker. In her speech, Shultz stressed a similar message as Benoit Samuelson. The overarching theme from both speakers was that in today’s day and age, with hard work, anything is possible for female athletes.